by Robert M. Keller, all rights reserved. GNU General Public License, v2. Impro-Visor is a Registered Trademark. Lead sheets and solos can be constructed through either point-and-click or using a plain text editor (one is provided, but any editor can be used). Optional automatic note coloration shows whether notes are consonant or dissonant with chords and scales. Chords may also be entered quickly through a "roadmap" editor, which also analyzes chord changes for implied keys and idiomatic progressions ("bricks"). Harmonic note entry option guides the user to select notes that are consonant with harmony. Similarly, transposition options provide chromatic or harmonic transposition. Solos or solo fragments can be played back immediately on the computer, with automatic rhythm section accompaniment. Can be used for self-study, classroom, or play-along. Any segment of a leadsheet can be played back in looped mode. Users can define new accompaniment styles. There is spreadsheet-like Style Editor, and a Style Extractor facility that helps create styles from MIDI performances. .
Solos and heads may be exported as MIDI files, with accompaniment if desired. Solos and heads may be exported as MusicXML, for import to other popular music notation software. It is not necessary that the soloist memorize the solos that are created in Impro-Visor. The act of constructing solos is intended to help one get a better understanding of the tune and of solo construction. But one can use some or all of the ideas from pre-constructed solos, as many generations of outstanding players have done. Impro-Visor also provides a way for the user to create and save licks for later use. Lick creation is helpful in understanding how to construct interesting lines over chord changes. 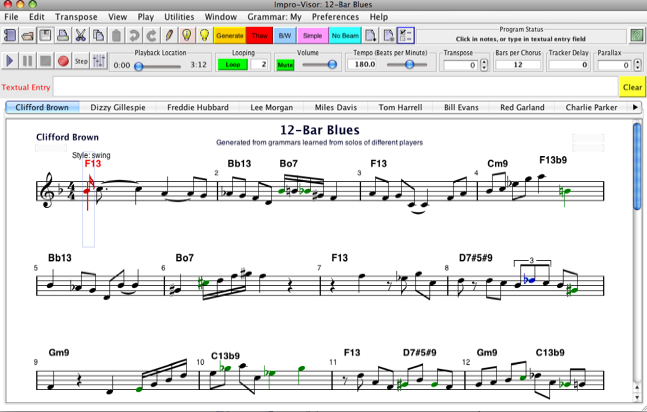 When used for transcription, Impro-Visor allows easy "mining" of selected licks from a solo for future reference. Impro-Visor uses menus to help one choose notes, cells, idioms, licks, and quotes for use in constructing a solo. Musical knowledge about chords, scales, licks, etc. are definable by the user or instructor, in the form of a vocabulary text file. These items are defined in a single key, and Impro-Visor will transpose them to any key. Impro-Visor includes a powerful lick generation capability. Licks, or entire choruses, can be generated in near-real time just by pressing a button. The generation of licks is controlled by a user-modifiable grammar, so that a range of styles and complexities is possible. Impro-Visor can learn grammars for a particular style from a corpus of solos. Impro-Visor saves solos and other lead sheets as free-form text. We call this leadsheet notation. Although a point-and-click interface is provided, users can optionally enter chords and/or melody in this notation with a standard text editor and have them displayed as a lead sheet in Impro-Visor. The documentation tells how to create and interpret the notation. The notation also provides slash-chords and polychords. Any number of leadsheet windows can be open simultaneously. The user can cut and paste melody and chords from one window to another. by a grant from the Baker Foundation, and by Harvey Mudd College.